JOH Chronicles: May 21: Christian Bautista in Singapore!!!! May 21: Christian Bautista in Singapore!!!! I may be calm on the outside but am screaming like a high-pitched teenager on the inside. 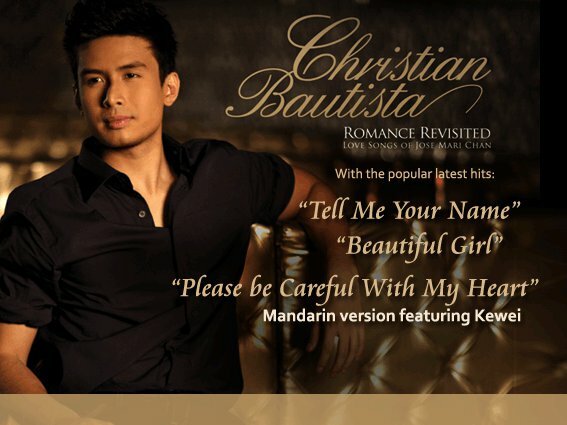 CHRISTIAN BAUTISTA'S COMING TO TOWN!!!! Asia’s Romantic Balladeer & Asiansation Christian Bautista will have a Live Showcase at DXO Club Raffles Avenue Singapore on May 21, 2010 (Friday), 7:30pm. The event will promote the Singapore album release of Christian Bautista’s “Romance Revisited : The Love Songs Of Jose Mari Chan”, which includes the Mandarin/English version of “Please Be Careful With My Heart”, a duet with Singaporean pop singer/actress Kewei.